Dave and Chris recall minimum wage not so fondly, except having cash in hand. Dave has been having trouble getting his Maxim parts in hand, but it was actually DHL getting them stuck in customs. When working with small quantities, ordering parts up front can be a necessity. @Roteno tweeted about doing a design and getting stuck without any stock in the world. Bunnie Huang (former guest) writes about the ‘soylent supply chain’ (“It’s made of people!”). Much of business is still done based upon relationships and working with other humans. Distributors have changed and consolidated, even since when Chris started working in the industry. Dave’s friend used to collect and compare business cards so he could see as sales people jumped from one distributor to another. FAEs aren’t likely to go away any time soon, nor will factory applications engineers. Marketing rep firms might though. Chris explained the difference between types of sales/marketing/technical support engineers on Engineer Blogs back in the day. 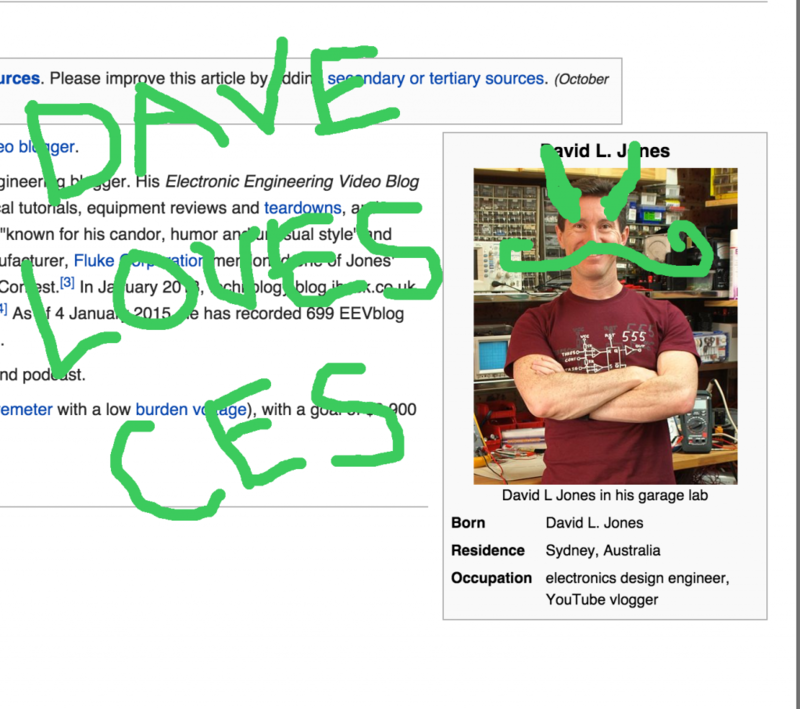 Dave now has an article on wikipedia! Quick, someone deface it! Elon Musk recently did a fantastic AMA on reddit. This made Chris realize he doesn’t really care about space (electronics); more specifically rockets seem boring, but it’s likely ignorance about the required specs for doing something like that (similar for a Model S). The Hardware Battlefield showcases new hwstartups at CES, a range of which don’t seem to be doing interesting tech. This competition feels similar to Dragon Den/Shark Tank. Amazon has big changes coming to Lab126 (designers of the Kindle) after failures of the Fire Phone. This highlights how even in big companies, even the “research” departments aren’t immune to the sales cycle (which may point to the fact that they aren’t truly research at all). Dave used to do research by doing long term testing of components. This still isn’t basic physics/academic research, but it’s closer than the development Chris mostly did. Bell Labs was able to operate because of the margins MaBell had due to their monopoly. Much like modern distributors, these margins continue to shrink. Graphene seems like a physics experiment that is on the cusp of being useful for the past 5 years. The New Yorker has an interesting piece comparing the graphene timeline to that of aluminum, which took nearly 50 years for its first commercial use and another 50 for its widespread use. The student who was told “No Microcontrollers” had a clever workaround. iRobot is offering the hackable Roomba for $200. Former guest Scott Miller used to run manufacturing for them. Dave is moving onto the next round of hiring for his intern. Still no word on which CAD package they’ll use, though many Aussie students learn Altium because it’s given to the Universities there to get them hooked. Chris is excited about the upcoming (but not research-new) feature on KiCad: Matched impedance calculation for traces as their being drawn. While Chris was interviewing after leaving college, he took part in a group interview. Will the changes to how courses are delivered to students affect how they learn and are hired for jobs? Do courses like this Georgia Tech online course help students stand out? Veritasium did a video about how online courses won’t revolutionize education, just like technologies before it. Speaking of horror movies, how does Penn Jillettes’ Director’s Cut compare with ‘When a Stranger Calls’? I agree with Chris, space tech is boring. Ha! That was the laugh I needed, thanks man. You both do such a great job each week! I’m glad you have continued to drive home the point that Bunnie put so well in his Soylent analogy. It tends to be so very easy to become vacuum sealed, especially when you work for/with yourself. I may just make more of an effort to overcome the shyness and make more real connections. There are a few of us out here that really benefit such advice and encouragement. Thanks again for the podcast, it is like a supplement I take each week to maintain my engineering health & vigor. Keep your iron’s hot and for Ned Kelly’s sake Stay Fluxy! I’m an FAE for a large manufacturer, and I think that some of the characterizations are good, but some pretty dated- all these roles have changed because of 2 things: shrinking margins and the internet. Before the internet you could not get data books without talking to the manufacturer, and pricing was either marked up distributor pricing or huge volume pricing. Distribution used to be big because they had a monopoly, so they could dictate the price (and they had to pay for their warehouse space). Distribution FAEs don’t really do much today- they’re mostly an excuse for the distributors to charge a larger margin (“Hey! We did work to get that design! We deserve that extra design-in margin, as opposed to just fufillment!”) The distribution FAEs have so many lines they can’t really give more specific information than you could get from the datasheet you could download yourself. Maybe if it is a really costly part (think very expensive FPGA), it would be worth their time to become an expert on a part- but for 1000 $1 microcontrollers? A box of doughnuts just ate up their entire margin on that. Being a manufacturer’s rep used to be the pathway to big bucks, particularly if they had a large account, as they would get a percentage of everything that ships to that account, no matter if they did anything or not, as they concentrated on the “relationship” between the manufacturer and the end customer. Usually it was arranging the meeting, picking up the manufacturers’ people at the airport and taking them to the customer. As the big customers have had to increase profits, they attacked the margin, and the reps lost out first. That part of the supply chain is withering and dying. Different companies pay their sales force in different ways, and commissions used to be the path to riches for FAEs and FSEs. Again, because of the focus on shrinking margins, that is going away. All corporate sales and applications engineers in my company are straight salary- I appreciate that, since the engineers can concentrate on being technical rather than fighting to be attached to a high volume customer design. In the US, big companies don’t do much design- they outsource that to the part manufacturer (and the price gets wrapped into the chip cost), or to the end device manufacturer, where the price gets wrapped into what the end device manufacturer charges. I think the distribution system is on life-support. In the US it is little more than a middle-man between manufacturer and customer, and in Asia it is dominated by corruption and questionable middle-man type relationships. The manufacturers don’t want to be in the warehouse business, and no big customer (or distributor) is willing to carry the costs of keeping inventory. I think we’re going to end up with a few big catalog houses that carry lots of things but charge for that service and being able to kit it and ship it to you quickly (with no technical support), and the silicon manufacturers who will either sell direct as the parts come off the testers, and where that can’t keep up, keep some stock at the catalog houses. Hiring decisions, especially at medium to large size companies, often require the HR department to deal with a slew of governmental reporting and other regulations around equal employment opportunities. This is one reason you may see some seemingly ridiculous employment tests and why the HR infatuation with commits or other quantifiable data. Hiring the best candidate is a subjective process that is inherently qualitative, but defending that hiring decision may turn into a legal debacle where counting commits is an easy defense. Sadly. Great show! I am an HR professional by day and hack by night.